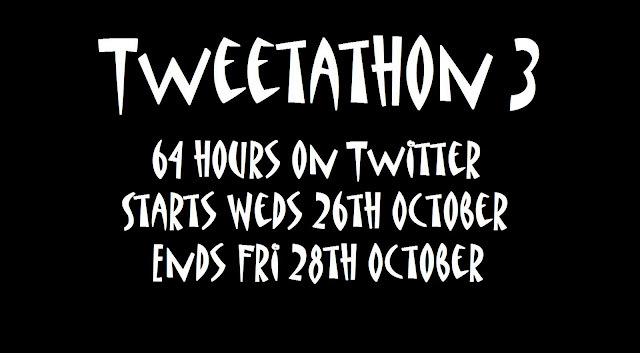 Yes it's that time of year again, in just over two weeks time I'll be embarking on another Tweetathon. This year I'm raising money for Chapter 1 who have several buildings in Southampton (my home city) where they provide accommodation and support for young homeless people. I'm aiming to raise £2000 to help pay for a new kitchen in one of the buildings, which, having been to visit, is desperately needed. As with the first Tweetathon the charity is being supported for two years by my place of work and the original plan was that I'd be tweeting from the shop floor for the first two days. Unfortunately the Wifi is not looking like it's going to be sorted in time so I'm back to being at home for the duration. As with last year there will be a webcam throughout, so you'll be able to watch me turn into a puddle. You'll be able to find the feed right here on diaryofaledger.com or if you're on an iPhone you can download the Ustream App (for free) and search for Tweetathon3. Apps are also available for Android, iPad and Mac. Because I can't be out and about tweeting 'live' I'll be running a pretty much open door policy at home. If you want to come over and visit at any point during the Tweetathon to help support let me know. People love seeing other people from Twitter on the webcam besides me, so if you can get to me, you are very welcome to pop round and make me a cup of tea. It all starts at 8am Wednesday the 26th October and ends at midnight 64 hours later. If you would like to donate you can do so on my JustGiving page. Thanks.